Happy Monday friends!! I cannot believe we are in the last full week of October. That means Halloween is next week. And if you are looking for fun Halloween food ideas, be sure to check out my post from last week. Halloween themed breakfast, lunch and dinner ideas. Now onto 5 easy meals for your family table this week. I love a good soup in the colder months, so when I saw this recipe for Carrot Soup & Roasted Veggies I had to try it. This soup is so full of flavor and a bit healthier as it gets the creaminess from white beans. The perfect fit for Meatless Monday. You can grab the recipe here. 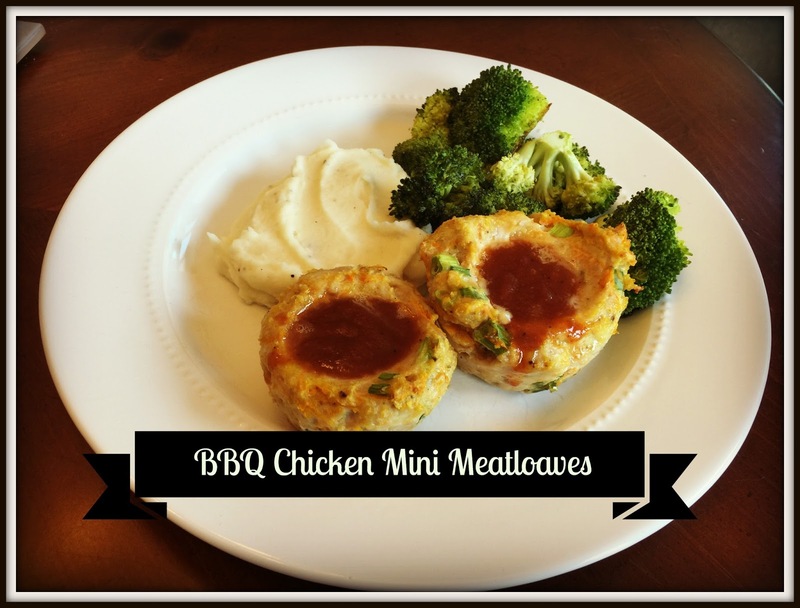 A slow cooker meal on a busy weeknight? Sign me up! In a crockpot add 1lb of boneless, skinless chicken, 1 jar of your favorite salsa and 1 cup of chicken stock. Cook on high for 6-8 hours. Take of the chicken, shred it and return to the pot. Serve with all your favorite taco fixings! You can find some of my taco bar tips here. 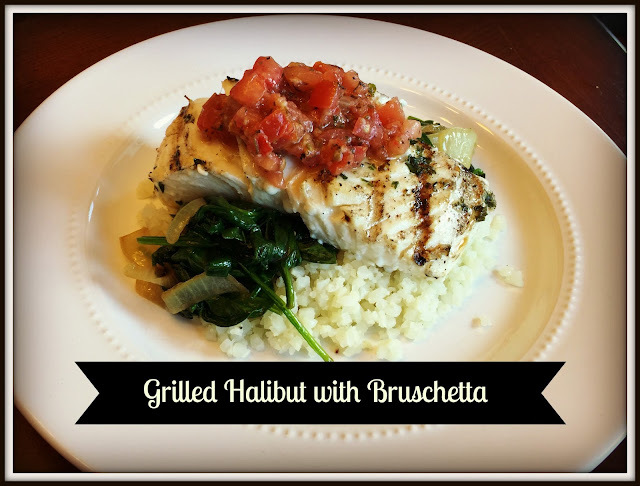 This Grilled Halibut topped with bruschetta looks fancy and complicated, but its really anything but! Our local grocery store has an olive bar, so I just grabbed some fresh bruschetta there. Drizzle the halibut fillets with a little EVOO, sprinkle with salt & pepper and grill for 10-12 minutes. Top with the bruschetta once they come off the grill. We paired ours with some cauliflower rice and sauteed spinach. An easy way to fancy up your Wednesday! 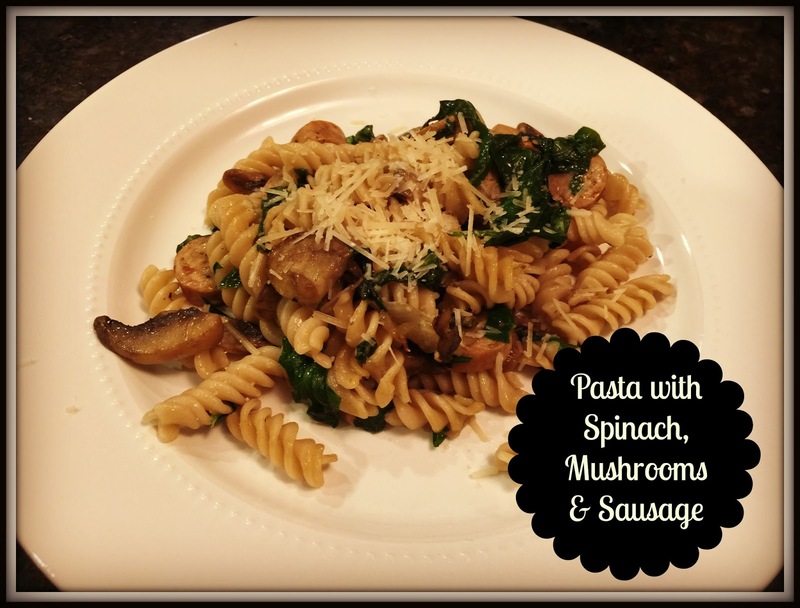 Spinach, mushroom and sausage casserole is on tap for Thursday night. It's a simple casserole, loaded with veggies and made a little better for you. Cook one package of pasta according to the package instructions. I like to use the Jovial brand- it is a brown rice pasta and tastes delicious. While the pasta is cooking, saute one small chopped onion with one package of sliced portabello mushrooms in a few tablespoons of olive oil until softened.I then add a few links of all natural chicken sausage. I buy one that is already cooked and chop it in bite size pieces. You can skip this step if you want to make it a meatless dish. Add in a few cups of spinach..don't be shy... the more spinach the better! Season with salt & pepper and mix with the cooked pasta. Transfer to a 13*9 dish and sprinkle with some grated parmesan cheese. I bake it at 350 for about 10 minutes. This dish can easily be made a few days ahead of time and just warm it when you need it. Be sure to stop by tomorrow for Show & Tell Tuesday....we are sharing our favorite holiday.